Tucked aways in the Italian hills where the country borders Switzerland, sits Ar.Pe.Pe, a winery nick-named for Arturo Pelizzatti Perego. Today, his three children continue his magnificent work of expressing Valtellina terroir and the beauty of Alpine Nebbiolo. The varietal here is known as Chiavennasca, and protected by mountain slopes and evading the famous Piemontese fog, it has a delicate Pinot Noir-like finesse. Tasting these wines blind, I am fascinated to find an elegance reminiscent of a notable Burgundian producer, but with a distinctive energy that is hard to deny as Italian. Such a unique style! It may look like a picturesque, mountain climber’s dream but farming steep slopes 700 meters up is no easy feat - I certainly won’t be signing up for ice-slicked mid winter pruning ! -so quantities are limited. Even more so given the amount of careful attention that goes into the 13 hectares of terraced vines. What’s coming out of the vineyard and into the bottle is only the best of the best, earning the winery its fame among those in the know as arguably the best in the region. Which is why I would say these wines are some of the most exciting to finally make their way into the selections of Hart & Cru. Hard to get into Ohio, but thankfully here now. Not meant to be consumed before their time, the family doesn’t release the wines too young, and thus the impressive back vintages on offer. 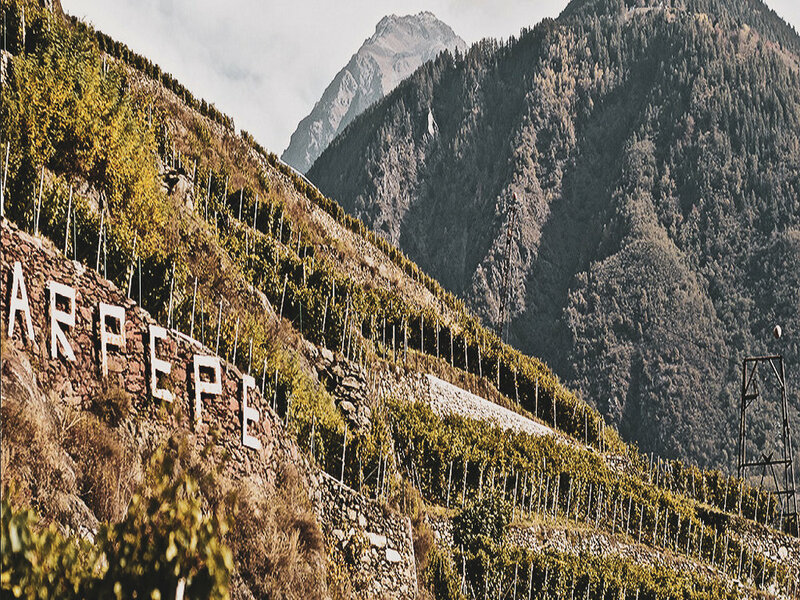 The Rosso di Valtellina DOC from ARPEPE first saw the light in 2003, after a sweltering summer that had put our vines and our winegrowers sorely to the test. It would not have been fair to demean all their hard work by selling off the grapes, which were unsuitable for making a vintage wine. The choice came naturally: what might have had little value in the distant future could be given great dignity when young. The Rosso di Valtellina thus acquired a free and light-hearted personality, even though its elder siblings, more serious and refined, feared it might not last for years. Castel Grumello, the property of the De Piro family in the fourteenth century, is a twin fortress, consisting of two separate complexes once joined by walls, overlooking the hill with Nebbiolo from the Alps vineyards. It gives its name to this wine, which is made with grapes from the two company-owned vineyards in the Grumello area. In years when low levels of tannins suggest brief ageing in large barrels, the Valtellina Superiore Grumello Rocca De Piro DOCG is always surprising for the speed with which it becomes ready to drink. And from the moment it makes its debut on the table, it is always on the spot: ready to drink, but also perfect for ageing with the reserves in the cellar. Stella Retica is made from the rocky upper parcels of the Sassella zone. “Sassella” means rocky in the local dialect and a quick visit to the vineyards shows you why the area earned that reputation. This is the part of the valley where the terraces are at their steepest and the soils their shallowest, the latter is more rock than soil per se. The wine is macerated for 18 days in stainless steel and it spends two years in old large-format chestnut botti (50 hectoliter). "Rocce Rosse" or "Red Rocks" comes from a single parcel from one of the highest points in Sassella. The red rock that the vineyard is named after is red granite. When the wine is produced, it is usually the family's favorite wine in the cellar. The wine is macerated for 35+ days stainless steel and it spends five years in a combination of large-format chestnut and oak barrels (40-50 hectoliter). The vines in ‘Vigna Regina’ are planted in the most shallow, rocky part of the Sassella cru. As a result, the vineyard has the reputation of producing the most linear of the family’s wines.